(On the left - Southern Walls) One of the most magnificent stained glasse of the Cathedral in Chartres : The Blue Virgin (12th century). 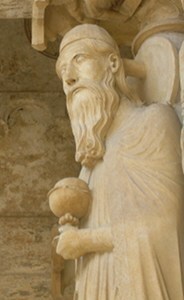 (On the right - Northern Gate) Melchizedek, King of Salem, holds a chalice containing the Philosopher’s Stone. These alchemical symbols, even though widely spread elsewhere, hold a special meaning in Chartres. Reciprocally, arts, with emotional energies of Unconditional Love, allow one to combine wisdom and personal experiences. And so it is that Alchemy is an art. Alchemy is the art of transformation. The art of transforming oneself in order to, then, learn how to transform others. And so, the stained glass, as well as other items in Chartres Cathedral are wondrous, multi-level, allegories of Alchemy. Most of the stained glass in the Cathedral is from the 13th century and a few travelled through time from the early days of the 12th century, when Master Alchemists of the Knights Templar worked their art in Chartres. 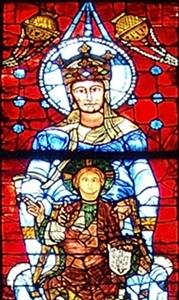 A magnificent example of such 12th century stained glass is the Glass of the Blue Virgin, Our Lady of the Beautiful Window. Secrets alchemically instilled in this masterpiece are multifold and a contemplation meditation on the blue used in this glass can open hitherto unsuspected doors. And that is because this blue is an Alchemical Blue. The process used to create this special hue of blue has now been lost. It has been lost together with Alchemy, because it was implemented by Alchemical means. Those panels were infused with high frequency electro-magnetic energies of Unconditional Love and Unceasing Light. The doors opened by the Alchemical Blue are the same as those opened by free natural electro-magnetic energy Healing Treatments, Miracle Waters Healing Treatments, and Spiritual Awakenings we do give to others. The visible light spectrum ranges from red up to blue through yellow, and each color one can perceive represents different combinations of the energies of Love and Light. As the low frequency red color represents large amounts of Light containing little Love, and the high frequency blue color represents large amounts of Love containing little Light, medium frequency golden yellow is used to indicate a perfect balance between the energies of Unconditional Love and Unceasing Light. And so, while the splendid Blue Virgin of this stained glass is one emblematic icon for the Cathedral, this stained glass also contains other wonders. Underneath the Virgin, three panels describe the well known New Testament’s account of the first Sign or Miracle of Jesus at the Wedding at Cana. According to the Gospel of John (2:6-9), “And there were set there six waterpots of stone, after the manner of the purifying of the Jews, containing two or three firkins apiece. Jesus saith unto them [the servants], Fill the waterpots with water. And they filled them up to the brim. And he saith unto them, Draw out now, and bear unto the governor of the feast. And they bare it. When the ruler of the feast had tasted the water that was made wine, and knew not whence it was (but the servants which drew the water knew;) the governor of the feast called the bridegroom” And so it is that, testifying to this alchemical transformation process, Chartres Masters of the Craft portrayed three jars in the scene: a red one, a blue one and a third yellow jar. In reality, the “wine” Jesus created out of water here is not fermented grape juice. Vine and wine have gained a rich symbolism throughout history, in part with such scriptural accounts as the one depicted here. However, there is the simple fact that, when one drinks wine in a moderate way, a state of expansion and euphoria is induced. And so, wine is used here in an allegorical manner to describe the state resulting from rapid Consciousness expansions, both by practicing mind expanding spiritual techniques and/or consuming high frequency Healing Waters. The same Healing Waters are found on the Northern Gate, dubbed the Gate of the Initiates, in the Chalice served by the Priestly King Melchizedek. Melchizedek or “Melchi-Zedek” is King (“Melchi”) of Justice or Righteousness (“Tzedek” in Hebrew), really meaning he is Master in balancing the energies of Unconditional Love and Unceasing Light. As explained in the Revelations series of CDs, Unconditional Love is the left plate, and Unceasing Light is the right plate of scales here portrayed by the feeling of equanimity given out by Alchemist Priest Melchizedek, the one called in Genesis, “priest of the most high God” (Gen 14:18). Such an ultra high frequency balance is required to implement the highest levels of Alchemy, and use the “Stone” steeping in the Chalice. This ‘Philosopher’ Stone is the connection to the high frequency energies of Alchemy, as well as the pineal gland, which enables one to fill the “Chalice” of one’s physical body and Light Bodies up to natural overflowing toward others, as portrayed by billowing incense ready to come out from Melchizedek Priest’s censer. And so it is that a reading in Chartres Cathedral of stained glass and statues with proper codes, tying together with the Story of Creation, enables one to unlock a wealth of ancient wisdom on Alchemy and much more. Explanations on the process of using code words and images, as well as details on Alchemy are in our Revelation series of CDs and our CD on Moses and Septimus, Two Men Who Changed the World.